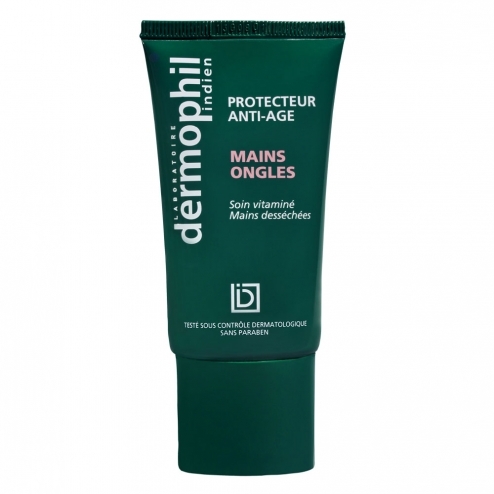 Protects the skin from daily and climatic aggressions. Protective and restorative cream for the care of desiccated hands, rough, and hands damaged by the daily external aggression: bad weather, wind, cold, pollution, products strippers. Particularly nourishing and moisturizing for the skin, this cream enriched with vitamins, also improves the resistance of the nails. Concentrated emulsion, requiring only a small amount of product when applied. Hand and Nail cream is used all year, at any time of the day and in the evening, at bedtime. Increase application frequencies when hands are exposed. INCI formula: aqua, paraffinum liquidum, glyceryl stearate, PEG6100 stearate, hydrogenated starch hydrolysate, talc, cetyl alcohol, dimethicone, stearyl alcohol, phenoxyethanol, tocopheryl acetate, triticum vulgare germ oil, borago officinalis seed oil, propylene glycol, panthenol, carbomer chlorphenesin , perfume, triethanolamine, allantoin, unsaponifiable sesamum indicum oil, retynil palmytate, tetrasodium EDTA, arachis hypogaeaoil, equisetum arvense extract, tetrabutyl ethylidinebisphenol, pantolactone, ascorbyl diplamitate, BHA, BHT, tocopherol.